Stuart Levine & Associates’ values-based leadership development programs are built upon this primer that provides practical tools for getting results. Many CEOs have relied upon this book for cultural transformation, leadership mentoring and the successful culmination of mergers and transactions. “The fundamentals and rules in this book created the foundation for the accelerated learning of our senior management team and subsequently our entire organization…they helped us to focus on the customer, eliminate communication breakdowns and strengthen our financial performance.”– Thomas J. McAteer, Jr. President and CEO. Vytra Health Plans. “I’ve told my kids that if anything happens to me, there’s only one book that reflects exactly how I would like them to lead both their professional and personal lives, Stuart’s book, The Six Fundamentals of Success.”– Richard J. Daly, Chief Executive Officer. 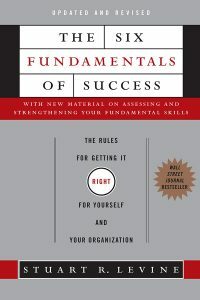 Broadridge Financial Solutions, Inc.
“While there are no quick fixes, The Six Fundamentals of Success is a great book for a leader who’s stretched thin and wants to let his or her team know how to get things right. I love this book!”– James Orsini, Executive Vice President and Director of Finance and Operations. Saatchi & Saatchi New York. “Any ambitious, thoughtful and upwardly mobile manager should find many useful, career-enhancing pointers in The Six Fundamentals of Success.” – Josh S. Weston, Former CEO, Automatic Data Processing Inc.
“Stuart Levine has captured a lifetime of successful rules and put them into a simple and practical context for executives at all levels.” – Walter Lin, President, H&L Computer Inc.